Is your garden overrun with mint? Fortunately, there is a good use for every single sprig of that generous bounty of mint. For instance, if you’ve ever purchased mint extract for cooking or as an ingredient in your homemade bath and beauty supplies, then you know that mint extract is pricey, and organic mint extract is pricier. Read on to see this easy, nearly effortless way to make as much of your own mint extract as you could ever want! 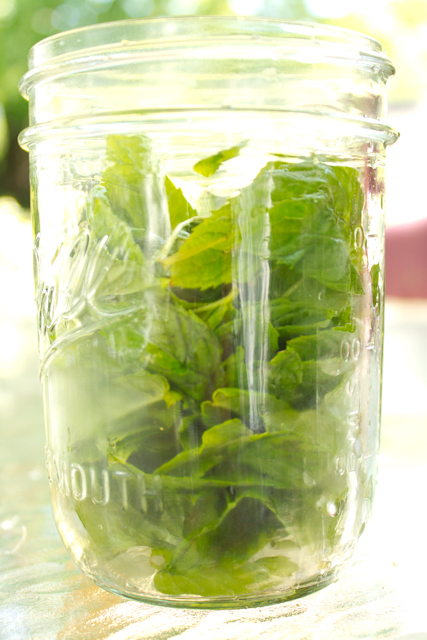 First, harvest enough mint leaves to fill your airtight container of choice when loosely packed. While you could sort between your mint varieties, I usually use the “mutt” approach and take them all–my mint extract includes peppermint, chocolate mint, and a little spearmint. While I’m picking through the leaves and rinsing them, I like to sanitize my container, either in a boiling water bath or in the dishwasher–although I’ve never heard of someone becoming ill from consuming or using mint extract, I always sanitize food-bearing containers, and it’s especially important to me to do so if what I’m preparing will be stored at room temperature, as this mint extract will be. As you fill you container with mint, take care to bruise each leaf, by squeezing it or crumpling it or rubbing it between your fingers. This “muddling” will allow the oils in the mint to better leach into the vodka (did I mention that there will be vodka?!?). To save time, you may coarsely chop the leaves instead, but not too thinly, because you don’t want them to be difficult to sieve out of the vodka(!) later. 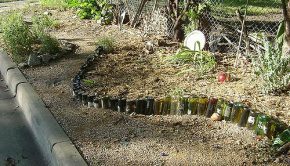 You don’t want to overpack your container for two reasons: 1) If the vodka can’t easily reach all of the leaves, then they can’t contribute their oils, and 2) if the container is too full of leaves, then they may uncrumple over time and sit higher in the container than the level of vodka. Leaves exposed to air at room temperature will spoil, ruining your entire mixture. 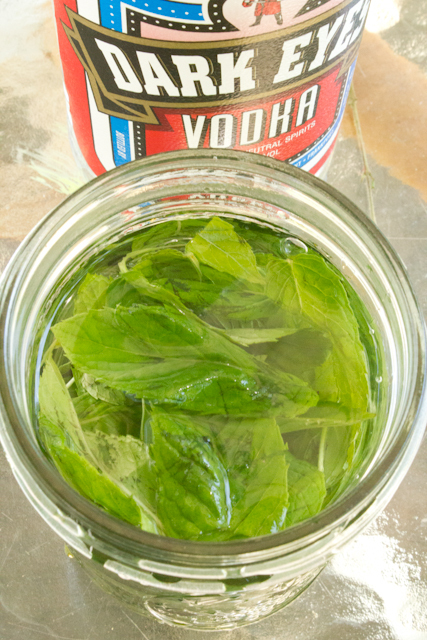 Pour vodka over the mint leaves in the container, covering all of the mint entirely. Honestly, I have no idea if the quality of vodka is important to the overall quality of the extract, but my rule of thumb is the same as Martha Stewart’s–I purchase the highest quality of ingredients that I can comfortably afford (unless it’s for a children’s party, and then I fully admit that I usually purchase the cheapest ingredients that I can get away with). Because this mint extract is such a massive savings over store-bought mint extract, I can justify purchasing pricey vodka, and because my children will be eating the food and using the soap that we make using the mint extract, the pricey vodka that I purchase is organic. Next, seal the bottle, set it somewhere dark and cool (I put mine in the basement), and forget about it. Let the extract steep for approximately 6 weeks, then smell a little smell and/or taste a little taste. 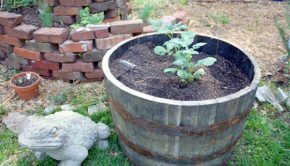 If the mint doesn’t completely overpower you, it’s fine to let the container sit for as long as it needs to, so just check back in with it every few weeks until you’re happy. 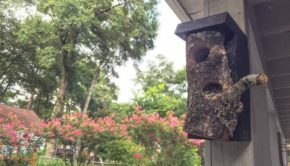 To finish the extract, decant it by pouring it through a small-hole sieve or cheesecloth into another container, until the extract contains no solid matter. The finished extract can be stored in your cupboard for a pretty limitless period of time. In case you don’t happen to need an entire quart of mint extract for your cooking, then consider that mint extract can also be used in a variety of bath and body recipes, including homemade soap, and homemade mint extract, poured into a little jar with a nice label stuck on, makes an excellent gift. Also? You haven’t truly lived until you’ve eaten homemade mint chocolate chip ice cream, made with homemade mint extract. Yum! This looks great. But i don’t drink so…………… …..what could I use OTHER then vodka. This would help alot. Extracts are all alcohol-based, even the chemically flavored ones you buy in the store. 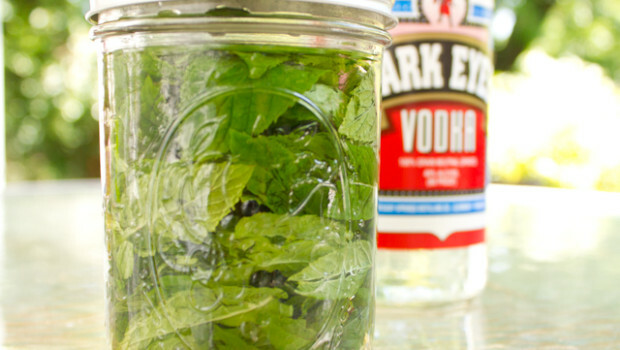 If you wouldn’t use the leftover vodka, you can pick up a smaller bottle so you’ll use the whole thing for the extract. –about whether vodka could work as a solvent for THAT instead of the rubbing alcohol that I used. You could use your leftover vodka to run the experiment for us! I hope Julie’s tips are helpful for ya! From what you’re describing, maybe this would be most helpful? Israel is a warmer climate than Indiana, so it’s perfectly possible that your climate is too warm for steeping the extract at room temperature. If it was me, I’d try steeping the extract in the refrigerator, and I’d only try a small amount, so that I wouldn’t waste a ton of vodka. Another possibility would be, as Becky suggests, that some mint leaves are getting exposed to air and thus spoiling the entire batch; for that, you could fashion a mesh screen that you could insert into your Mason jar, kind of like a French press, to hold the leaves down–again, I’d try only a small portion to experiment with if it was me. If you find something that works (or doesn’t work! ), definitely comment back and tell me! I do marijuana extract in oil. I like using coconut oil. I also make honey. I would guess it’s the same process. The alcohol process is the same! 16 oz of honey or oil and 1 oz mint/MJ. Put mint leaves in stuffing bag or cheese cloth. Tie like tea bag! Put in crock pot….the temp is just right and don’t have to worry about getting to hot. Let it cook for 12-24 hrs and take tea bag out…squeeze it. Then jar oil/honey. I freeze what I don’t think I will use right away. I’m going to be doing that with my marijuana honey. I love mint in my tea so no more paying extra for mint tea bags! How awesome! I am currently trying this. What color should the extract be? Mine turned brown within a day, but I’m not sure if that is a bad thing. It’s only been in the cabinet for about 4 days now. Open it up and smell it–is it starting to smell minty? If it is, then it’s probably okay. If it smells ugly or off, then it’s not okay. Next, taste a little taste, just a touch of it to your tongue–is it starting to taste minty, or even still like vodka? If it is, then it’s probably okay. If it tastes off or soured, then rinse out your mouth and you’ll be okay. Four days, though, is such a small amount of time–I’d give it a couple of weeks before I checked up on it at all. If leaves aren’t sticking up above the level of alcohol and getting exposed to air, then it’s probably fine. I put up another batch of extract about a month ago, when I wrote this post, and it’s coming along great. I’ll figure out how to post a picture in the comments, or I’ll add it to the end of my original post, so that you can see what it’s supposed to look like after a month. 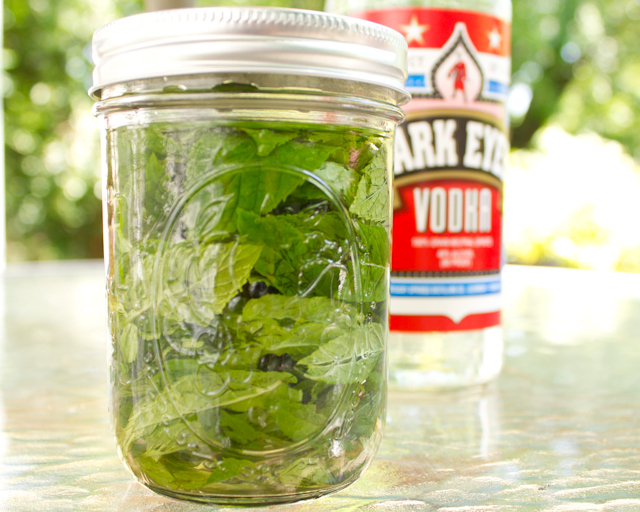 mint is an oil, and many websites mention allowing the oil to separate from the vodka. Have you found this to happen? is it bad that it is made with alcohol ? 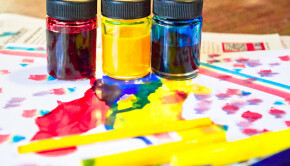 Like if you were to use in drinks for your kids or on their bodies and hair ? I would love to try and make this for people as a gift and for myself but everyone I know has kids so I want to make sure the alcohol would be ok for the kids.. 🙂 this is my first time growing mint and making it.. In general with extracts, the amount you’re adding to a recipe is so small, the alcohol would be pretty negligible. It should be fine, but your doctor would be able to tell you better than I can. This is wonderful for making homemade Mint Chocolate Chip Ice Cream! Thanks for sharing! It just needs to be clean, you don’t have to sanitize everything because vodka is 40% ethanol. Actually a 5% alcohol solution wouldn’t be harmful because it would turn to vinegar over time. Sounds excellent. I checked my cupboard and seem to have run and gin. Can I substitute these for the vodka? Rum and gin both have enough alcohol in them for this to work. The flavors will be different, of course, than if you’d used vodka, but that will be part of the fun!